Below are the steps to program the remote to the system. 1. Put the key in the ignition and twist it to ON without starting the engine. 2. Press and hold the valet button/switch for 3 seconds (see figure). Use a pencil or any narrow object to poke through the Programming Button access hole. 3. The status monitor on the dash turns on for 5 seconds. For some vehicles, it's a double chirp instead of the flashing light. 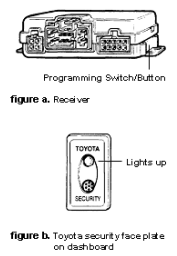 programmed to operate the system - other button can be programmed to operate a second Toyota vehicle with the same system).